I don’t even know what to say about these… little puffs of love? I want to say they are perfect football food, but they are perfect EVERYTHING food. Um, I’m kind of even considering them for Thanksgiving which is huge because Thanksgiving in my world is all omg-don’t-make-one-untraditional-thing-including-real-life-cranberry-sauce. It’s true. It’s like pull-apart bread meets the softest dinner roll meets flavorful buns. (I laughed at the last part because I’m a ten-year-old boy inside.) But really. There is a TON of flavor here. 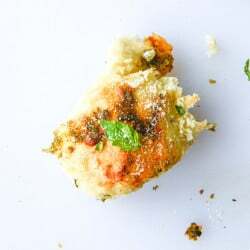 This is the first recipe you saw pop up in Sunday’s video and it’s simply a delicious dough covered in loads of butter, pesto, parmesan and fontina cheese. To die for. I’m just going to shorten that to TDF because I type it in nearly every blog post. Noooo I can’t be more original. I used this classic pesto from DeLallo – because let’s be real – I’ve more than documented my share of dead garden herbs over the last three years. I can’t keep them alive to save my own life. But! I’m hoping now that we’ve moved and I might have more space/room for a mini garden of sorts, I can get my act together and grow some green stuff. If you’re in that boat, the successful-at-growing-herbs boat, then you probably packed away a bunch of basil at some point in September… and this is the perfect excuse to use it. Obviously: with more bread and cheese. You need a good amount of pesto though, because you’re going to smother the heck out of the buttery dough. The other option is that you can make an arugula pesto… perhaps my all-time favorite pesto, but I don’t find it to be as potent when it comes to flavoring the bread. Sure, it’s peppery and wonderful, but it lacks some of that herby flavor. You know? You can totally mix it WITH basil though!! Or or or… you can make the double herb kale pesto from Seriously Delish but the real question is who wants to ruin their bread and cheese with kale? Not I. Let’s save that for pasta and things like sandwiches and such? You probably should not take my advice though. Yesterday I attempted to hide a large amount of chocolate from myself only to “discover” (remember?) it again by midnight so it’s not like I’m really the voice of reason here. The voice of reason says make these cheesy rolls though. They whispered it in my ear. Puffs of love indeed! HELLO beautiful! Last night, I stumbled upon the two huge bags of chocolate Halloween candy I bought a couple weeks ago. One of those bags contains Hershey’s Cookies & Cream Bars. For some reason, I cannot get enough of those bars! You know what else I cannot get enough of? Bread. Not only am I a total chocoholic, I’m a breadholic, too. LOVE this pull-apart bread, Jessica! Cheese, pesto, bread. I’m in bread heaven! These may be the bites of love that get me through football season. For that, I thank you. Pinned! Cheese + pesto + bread = 3 of my fave things! This recipe looks SO delicious. I’ll have to try it out when we have company in town in a few weeks! You and I are on the same pull apart bread wave length! And I love it. Never thought of pesto. Sounds and looks fabulous! 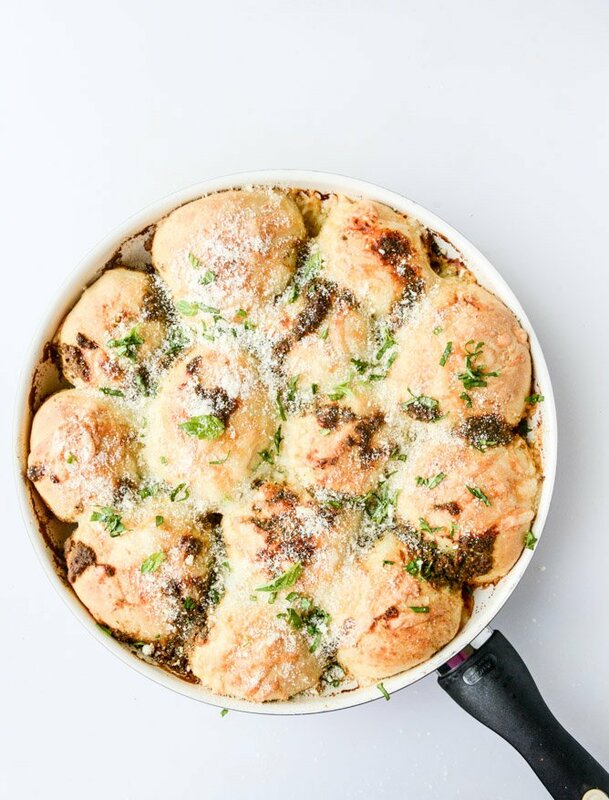 I have never tried making a cheesy pull apart bread, and that’s CRAZY. Time to change things. Agreed… just buy the pesto. It’s my dream to have a veggie and herb garden, except for the part where I have to garden. Hate it! Haha. Thanks for sharing this awesome bread! I always make pull apart bread for parties, adding some pesto is a nice kick! Great idea! What are the mixing instructions if we don’t have the fancy mixer with the dough hook? Can I use a normal blender or better to use my hands? I think the only way to improve cheesy pull apart bread is by adding pesto. So there you go. I am always looking for ways to dress up dinner rolls. This may be my new standby. 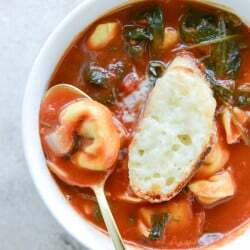 Would go perfectly with my meatballs and marinara recipe! Thanks for sharing! I love this! It looks amazing, but then, it’s bread and cheese, what’s not to like?! Can’t wait to try this one. Pinned! Is this recipe real? I mean seriously I need this in my life – yesterday. These are perfect. Mmmm pull apart bread and cheese…the perfect combination! Welp, this just makes me want to cry a little that things like this exist. And I just want to eat it all because it’s bread and cheese and pesto and all things I adore wrapped in one. Pinned! Mmmmmmm. How disappointed am I that I don’t live near you…. We would be good friends! Oh and Thanksgiving is aaaalllllll about traditions. Last year I visited my brother for the holiday and we ate in a restaurant. And there was pretty much no Thankshiving food. Never again! Hey! I just wanted to say that I love your blog and recipes! I made the bread tonight and while I was reading the instructions, I noticed that you might have forgotten to add the egg in the directions. I added the egg to the flour, salt, cheese, and pesto mixtures. Is that correct? I am all about a cheesy pull-apart bread. Add some pesto and I am set! Gorgeous! The last picture looks like a fish. I made this tonight, followed recipe to the letter. ick , it was SOOO dry and no flavor, what gives? Oh my daaaaaaang this looks delicious. I feel like it’s important to listen to the voice of reason, in this case – I’m listening to yours — HOLY YUM! Jalapeño might be the perfect addition to what looks like a fantastic bread. Not sure how that would play with pesto but jalapeño is a natural with cheese and should work well with pesto. Love love love!! Perfect preggers snack if you ask me!